UNITED NATIONS (AP) — Saudi Arabia and the United Arab Emirates gave $930 million to U.N. humanitarian efforts in Yemen on Tuesday as a war between a Saudi-led military coalition and Yemen's Shiite rebels enters its fourth year. 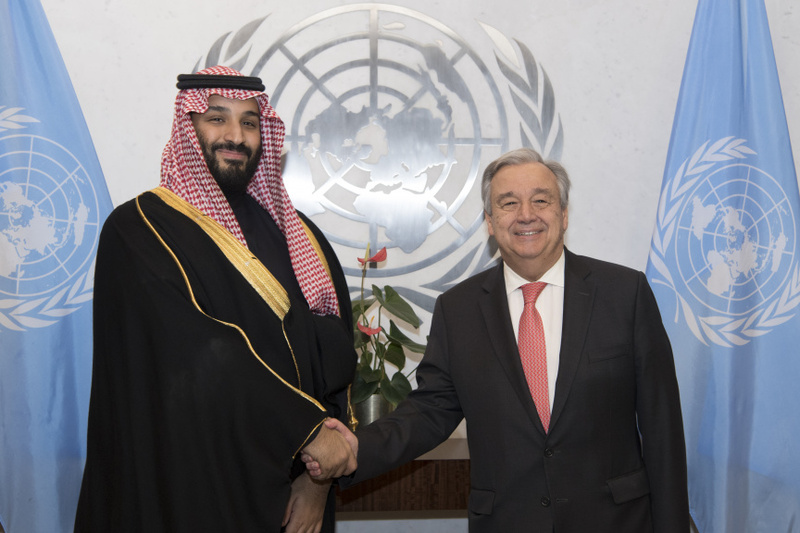 Saudi Crown Prince Mohammed bin Salman presented the previously pledged donation to U.N. Secretary-General Antonio Guterres as the two discussed Yemen. The Arab world's poorest country is in the grips of a stalemated war and what the U.N. calls the worst humanitarian crisis, with 22 million people needing aid. Guterres thanked Prince Mohammed for the contribution, which covers nearly a third of the total the U.N. is seeking for Yemen humanitarian aid this year. "On the other hand, we know that there is no humanitarian solution for humanitarian problems," Guterres added. "The solution is political, and we are entirely at your disposal to work together to find a political solution when that becomes possible." The U.N. said Guterres and the prince also discussed protecting civilians and needs for humanitarian access and open ports. Saudi Foreign Minister Adel al-Jubeir called the meeting "very productive and comprehensive." He said the two talked about avoiding foreign intervention in Yemen, particularly from Iran. Western countries and U.N. researchers have accused Iran of supplying arms to the Yemeni rebels, known as Houthis. Iran denies it, though a growing body of evidence contradicts the claim. The U.S. provides logistical support and weaponry to the Saudi-led coalition, which has been criticized for airstrikes that kill civilians and for a port blockade that brought Yemen to the edge of famine. The Houthis and their allies seized Yemen's capital, Sanaa, in September 2014. The war began six months later, with the coalition backing Yemen's internationally recognized government. Over 10,000 people have been killed. On Sunday, the rebels fired a barrage of ballistic missiles targeting Saudi Arabia. Fragments of one missile that went over Riyadh, the Saudi capital, killed one person and wounded two.